I am a bookaholic. I love to read. I cannot survive without reading. My favorite thing to do on a night out by myself is to browse through bookstores. Reading is a hobby/pastime/interest that I will never, ever give up. No matter how busy I am, how tired I am, or how many other things are on my to do list, I WILL find time to read at least a few chapters of a book every single day. And because of all that I thought it might be fun to start doing some posts on what books I’m currently reading. Because I’m never reading just one book at a time. What fun would that be? 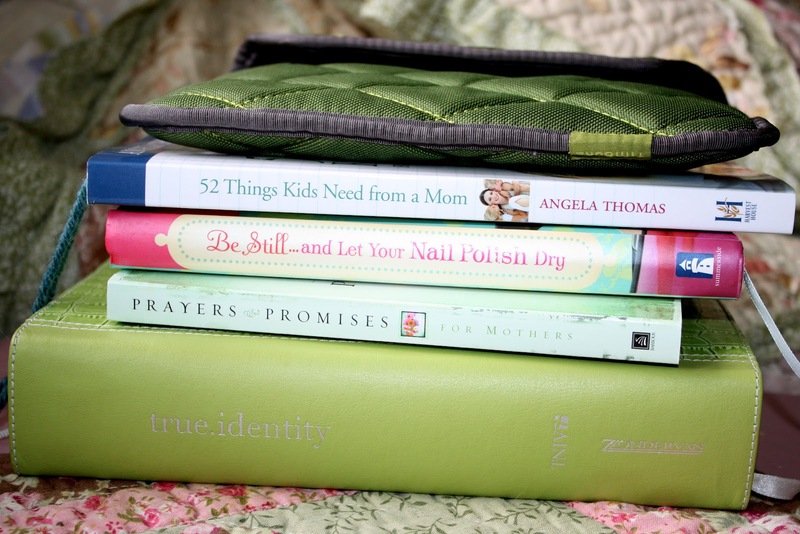 I always have my Bible on my nightstand. I can’t say that I’m that great about reading it regularly, though. I go through phases where I’m really excited to look up new verses pertaining to what I’m struggling with and going through every day. And then I go through phases where I’m so exhausted that the thought of actually searching for what I need sounds like way too much work. I picked up this particular Bible a few years ago and I love it, though. It’s the Today’s New International Version (TNIV) and called True Identity. This copy is targeted for women and has tons of excerpts and stories about how certain passages can apply to your life. I highly recommend it! 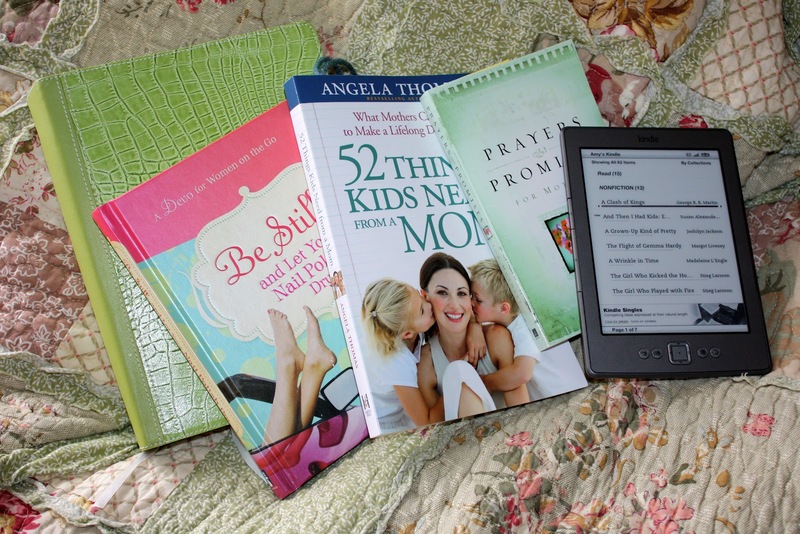 This is the first in a series of quick devotionals for busy women. I’ve been trying really hard lately to keep up with daily devotional reading. It’s something I used to do all the time before kids and I’d like to get in the habit of it again. Especially on those rare mornings I’m actually awake before my children, it’s a great way to start the day. I’m only a couple weeks into this one and it’s just okay. The last devotional I read, God’s Heart for You by Holley Gerth was fantastic and so easy to connect with, that I find this one a little bit lacking. I guess I just prefer devotionals that are right to the point and scream out something that your heart is desperate to hear on a daily basis. It’s not always that easy to find the importance in this book. I love this book!!! I never even would have known about it except it was on a special 50% off sale at the Family Christian Bookstore a few weeks ago – and they were sold out. The title was listed and I was definitely intrigued with all the struggles I’ve been having with Caden lately. So I looked it up online and ordered it right away. I’m so glad I did! This is probably the best parenting book I have ever read. It is so positive and personal, filled with easy yet perfect ideas to show your children more love and make your home a happier place. I’m about halfway through and ready to read it again immediately. It’s that good. I think this book has been out for a long, long time, but this is the first I’ve looked at it. Just today, in fact. So I’m only a couple pages in, but can tell it’s going to be very helpful for me. The very first prayer listed was about dealing with anger and not letting it get the best of you no matter how frustrating your kids are behaving. Definitely something I needed to hear today. I’m looking forward to reading more of it. Even though I’m usually reading a pile of books at once, I almost always stick to just one fictional book. I like reading fiction a lot more, but figure I need nonfiction thrown in to better myself and my relationships. I decided to read the Game of Thrones series because I wanted to know what all the hype was about. It seems that just about everybody I know has either read the books and/or seen the tv show and I wanted to be in the loop. I found the first book kind of boring. It was really hard to get into with so many characters and descriptions and trying to figure out a complex world that I knew nothing about. I’m finding the second book much more interesting, though. Now that I have a basis of characters to go from it’s easier to understand what’s actually going on. It’s definitely not my favorite series (so far, anyway! ), but it’s entertaining.